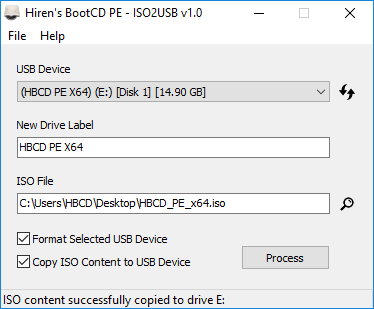 Hiren’s BootCD PE supports UEFI booting from DVD and USB flash drives. 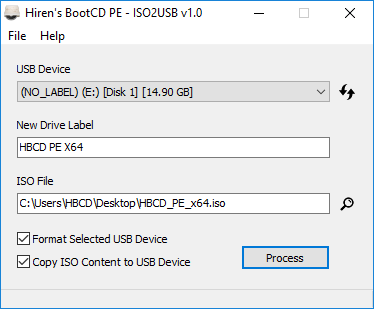 To format, re-partition your USB drive and to copy the ISO content into your USB drive properly, we have developed Hiren’s BootCD PE – ISO2USB portable tool. You need Administrator privileges to run it. It is free both for commercial and non-commercial use. Requires Windows 7 and later. Download ISO2USB.exe to your computer. Only USB flash drives will be listed in the USB Device list. If you can’t see your USB flash drive in the list, firstly try formatting your USB flash drive with Windows Format tool (Goto My Computer -> Right Click USB Drive -> Click ‘Format’… -> Click ‘Restore device defaults’ -> Keep ‘Quick Format’ Checked -> Click ‘Start’) and then click the refresh button on the right side of USB Device list. If the ISO file is located in same folder with the exe, then it will be automatically selected. Otherwise you can drag and drop the ISO file over the application window or you can select the ISO file manually. You can set a label for your USB Drive up to 11 characters. The characters must be alphanumeric and uppercased. The application will ask if you are sure to continue. Click Yes if you are sure to format your USB Flash Drive, lose the partitions and data in the drive. If you click Yes, the process will begin and then will be completed like below if there is no problem.